Really kid friendly. Fiesta Kids is wonderful. Good vegetarian options. Great staff, great food. Everyone there had smiles on their faces. Nice place. Nice people. Clean location. Close to a museum. Dislike - Our room was right above the resort bar, which made for loud nights while trying to sleep. Like - Friendly staff and service. The staff was extremely helpful and friendly. The design of the hotel was gorgeous. I loved its modern take on Mexican design. Sophisticated, yet clean and approachable. The pool was beautiful and had a great selection of seating options. I loved the Cevicheria by the pool for the fish and shrimp tacos and we really enjoyed breakfast a K'ambu. The music by the pool was a little too "Vegas" for my taste. I would have enjoyed something more relaxing and less party. This place is perfect for younger families, mine range from 4-9. Pirate pool and shallow area is perfect for the kids to play ball and explore. Food was a perfect balance of a chance to try new stuff with some happy favorites. Food was consistently good. Gelato and crepe bar was a daily hit. Beach Lifeguards were up in a tower but we’re actively patrolling beach and warning people about certain areas. Hotel staff was super responsive. Gym could open earlier and be updated, eqiptment was seriously dated. Absolute was the highest level of vodka which was disappointing. Property is condense and easy to navigate with both my father and the children, not too spread out. Great all inclusive place to stay. Plenty of eating options. You have both pool and beach hangout areas. Food is good. Clean. Great staff. We will come back. Located in Zona Hotelera, Fiesta Americana Condesa Cancun - All Inclusive is within a 5-minute walk of Aquaworld and within 15 minutes of other popular attractions like Maya Cancun Museum. This 4-star hotel has 502 guestrooms and offers a full-service spa, an outdoor pool, and free in-room WiFi. Enjoy dining at Restaurante Kambu, one of 4 onsite restaurants. Savor a meal from the comfort of your room with 24-hour room service, or entertain your taste buds with a beverage at the bar/lounge or coffee shop/café. An LCD TV comes with satellite channels, and guests can stay connected with free WiFi. Beds are dressed in premium bedding and down comforters, and the bathroom offers a hair dryer and free toiletries. Other standard amenities include a minibar, a coffee maker, and free local calls. 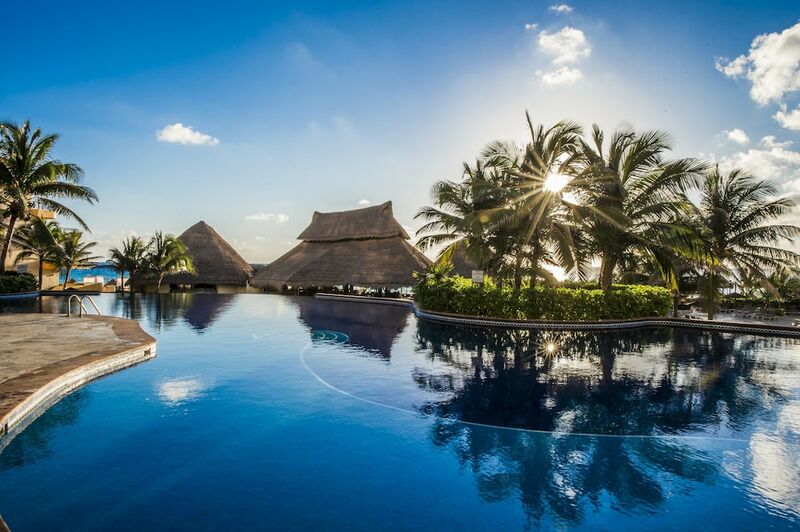 Fiesta Americana Condesa Cancun - All Inclusive features a full-service spa, an outdoor pool, and a children's pool. If you decide to drive, there's free valet parking. The front desk has multilingual staff on hand 24/7 to help with dry cleaning/laundry, tours or tickets, and luggage storage. Other amenities at this beach hotel include a health club, a spa tub, and a sauna. All-inclusive room rates at Fiesta Americana Condesa Cancun - All Inclusive are available. These rates are higher because they include onsite food and beverages in the room rate (some restrictions may apply). Restaurante Kambu - Restaurant open daily for lunch. Kalmia Restaurant - Restaurant specializing in international cuisine. Open daily for breakfast, lunch, and dinner. Mexicano Restaurant - Restaurant specializing in Mexican cuisine. Open daily for breakfast and dinner. Rosato Restaurant - Restaurant specializing in Italian cuisine. Open daily for dinner. Cevicheria - Bar specializing in Mexican cuisine. Open daily. The hotel has an outdoor pool, a children's pool, and a spa tub. A health club and a sauna are other recreation options. The nearest major airport is Cancun, Quintana Roo (CUN-Cancun Intl. ): 19-min drive, 10.2 mi/16.5 km. Book a Master Suite category or higher with a 7-night minimum stay, or 5 room reservation for a 3-night minimum stay in an Ocean Front category or higher, and receive a complimentary Luna wedding ceremony package. The Luna wedding package includes the following: Bride’s bouquet and boutonniere for the groom; symbolic ceremony with non-denominational minister; aisle runner in sand color; 4 tiki torches; use of bamboo arch (Chuppah); sound system with technician during the ceremony; wedding cake; a glass of sparkling wine per guest; special area in a restaurant for semi-private dinner; preparation of the wedding dress and grooms tuxedo/suit; special turndown service on the wedding night; upgrade to next room category for bride and groom (subject to availability upon arrival); 15% discount at Miiluma Spa (not valid for products or packages); and certified wedding coordinator. If the room requirements are not reached, this wedding package can be purchased for USD 920 (subject to change). Includes tax and service. This package also applies for a Vow Renewal Ceremony. Package includes up to 20 staying guests. Additional charges apply for Legal Weddings. All restaurants are subject to availability, times and capacity, 20 guests maximum. All functions above 20th guests apply restrictions.